The public light art installation, titled Project Cabrini Green, is a community-based art project conceived by artist and educator Jan Tichy. Project Cabrini Green involved over 200 people to realize, from Cabrini-Green and the wider city. Jan Tichy is represented by Richard Gray Gallery. From January to March 2011, together with over 20 students from the School of the Art Institute of Chicago, Tichy held two and three-day workshops with local youth at Cabrini Connections, Marwen, After School Matters Creative Writing Program at Gallery 37 and ThaBrigade Stamps – Cabrini Green Marching Band. In the workshops, students were introduced to public art and light art, and brainstorming sessions and group activities were held on the concepts of Home, Public Housing, Community and Demolition. The youth were then charged with the task of writing poems or texts that addressed the concepts above. Employing a computer program developed by SAIC students that translates sound into light, the youth performed their texts for recording, creating unique light patterns. These light patterns define each of the 134 LED lights at the high-rise. Thus, the youth’s voices literally “tell” their stories through light. 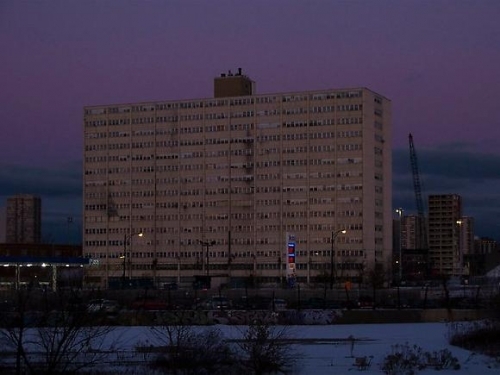 As a component of Project Cabrini Green, live-feed footage from the site will be projected at the Museum of Contemporary Art at street-level, on the corner of Pearson and Mies Van der Rohe streets behind the museum’s glass façade, thereby rendering it visible at night. A voice/light-activated model of the high-rise will accompany the installation, and the youth participant’s written texts and audio content will be available. Tricia Van Eck, Associate Curator, is the organizing curator of the installation at the Museum of Contemporary Art. The youth’s texts, the audio content, and the live-feed video will also be available on the project website.